There are no stars so lovely as Edinburgh street-lamps. When I forget thee, Auld Reekie, may my right hand forget its cunning! Edinburgh was Robert Louis Stevenson’s birthplace. He lived there on and off for the first 29 years of his life, and continued to visit the city until 1887, after which time he left Scotland, and Europe, forever. Wherever he was, RLS often returned to Edinburgh imaginatively. He wrote about the city in Edinburgh: Picturesque Notes (1878), and it was also a setting for Deacon Brodie (1880), Admiral Guinea (1884), “The Body Snatcher” (1884), Kidnapped (1886),“The Misadventures of John Nicholson” (1887), The Wrecker (1892), Catriona (1893), Weir of Hermiston and St Ives (1898). “I say, old man, Edinburgh is a very sanguinary shop, and bloodier than ever, you should be glad you are out of it” ( The Letters of Robert Louis Stevenson, ed. by Bradford A. Booth and Ernest Mehew, vol ii [New Haven: Yale University Press, 1995], p. 86). 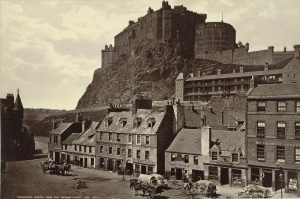 This page gives you the opportunity to learn more about Stevenson’s Edinburgh, providing information about his homes and haunts, the dark history of the city that inspired him, the city as it was in the Victorian period, and Edinburgh in Stevenson’s fiction. If you visit Edinburgh, you can see many of the places and buildings listed in this section by exploring Edinburgh’s Old and New Towns on foot. You can also see the many plaques and monuments in Edinburgh that are dedicated to Stevenson. Visitors to Edinburgh wishing to follow in Stevenson’s footsteps should certainly go to the Writers’ Museum, which has an excellent Stevenson collection. Please visit the section on our website dedicated to the Writers’ Museum (The Edinburgh Museums Service) to find out more.